The Beauty of our country HTML caption with a link. Designed on its own private and one of the most beautiful beaches in Malawi. 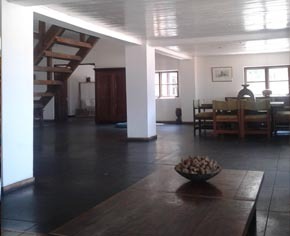 A contemporary 2 story, 4 bedrooms en-suite, spacious home, 425 sqm. With on the ground floor 2 master bedrooms with King size 4 poster beds with mosquito nets and cooling fan. Both of them with private seating area, en-suite bathroom with toilet and his & hers wash basins, en-suite room with double rain showers and your private hardwood deck ( 50 sqm) includes your own sun loungers for your comfort. First floor offers 2 romantic bedrooms with Queen size beds, mosquito nets and cooling fan. En-suite rain shower ,washbasin and toilet. A large relaxation area leading to the veranda, a private deck with stunning views of the Lake. Comfortable lounge area which will seat easily 8 guests, ceiling fan and a PD station. T.V corner with 32 inch LCD screen / DVD player / DSTV and multi stereo surround system. 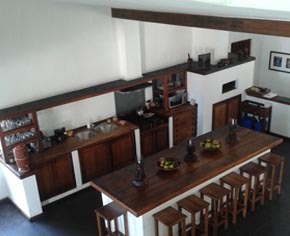 Large refreshment bar and gourmet kitchen. Dining area, with a massive dining table that will sit comfortably 8 guests in style. A stunning wood burning fireplace with contemporary steel grate. Separate guest toilet. When you exit the house on the ground floor thru the double hardwood locally carved doors you enter the beach. BBQ area located where you can enjoy your food / company and Lake Malawi. Covered Sun loungers where you can unwind, read a book or just doze off. © Copyright Mbamba Beach Lodge. All rights reserved.